Above is an early section of 101 Dalmatians that I regularly show my students when talking about walks. The three women are great contrasts in design and movement and we analyze how the visuals form our impressions of these characters. There are variations in timing. The first woman walks at 15 frames per step, which is a relaxed gait. The second at 10 frames per step, showing more urgency and the third woman walks at 8 frames per step and is clearly in a hurry. There are variations in body shape. The first woman is gangly, the second stout and the third svelte. There are variations in dress which imply what class the women belong to. The first woman wears an ill-fitting coat and is bohemian, the second woman wears a smartly tailored outfit and is middle class and the third woman wears fur and is upper class. 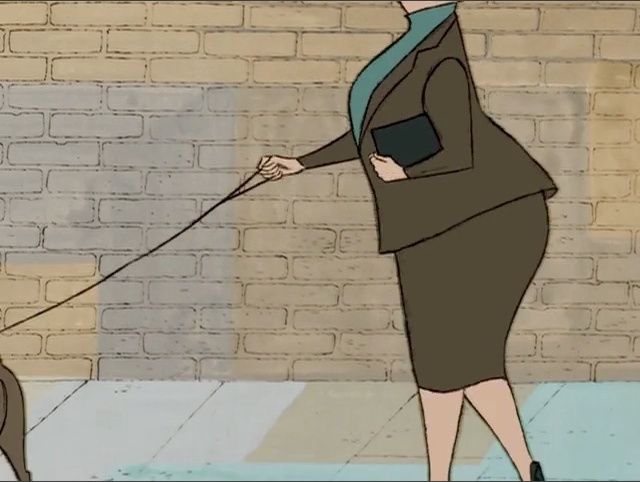 While I've seen the film many times and I've shown this clip easily dozens of times to students, there was something I didn't notice until this week: the way each woman holds her leash. The first woman is the most casual of the three. Her hand is in her pocket. The second woman is quite rigid in her arm motions and she holds the leash in a fist. This implies that she's very guarded and not willing to take chances. The third woman holds the leash with an open hand. That shows her confidence that nothing will go wrong. Then there's Anita, the woman who Roger will eventually marry. 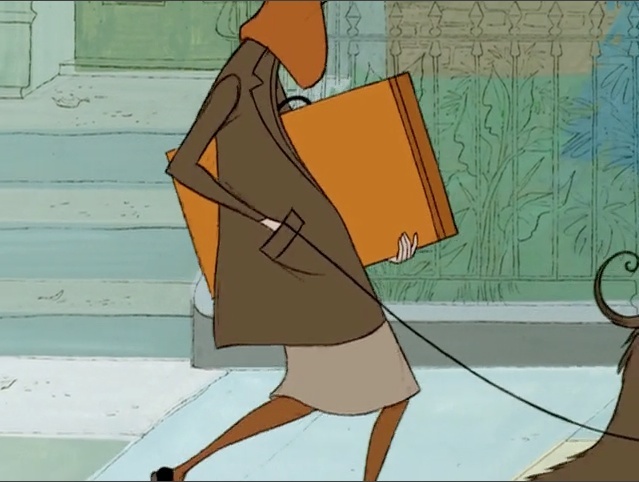 She holds the leash in a fist, but isn't holding the leash by the loop. She's not as rigid as the second woman, but not as confident as the third. 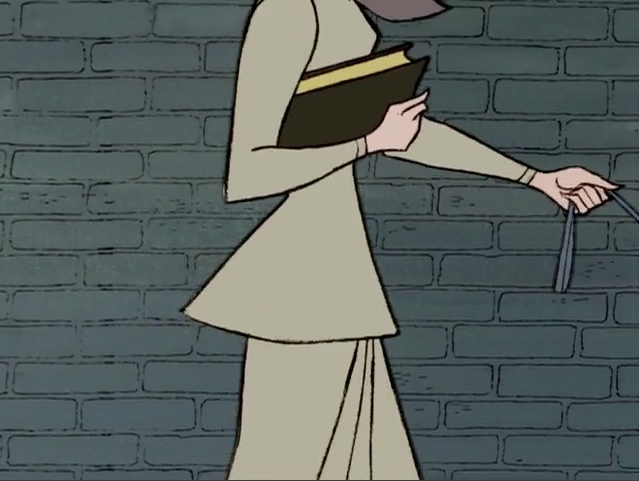 Also notice what she's carrying. The first woman, we see later, is a painter. She's carrying her supplies. The second two women are carrying purses. Anita is carrying a book, implying intelligence. At this point in the film, the women, including Anita, are just vignettes. The audience is only given brief glimpses of them. Yet it's clear that the artists have worked hard to visually differentiate the women and to give the audience clues as to who these women are. 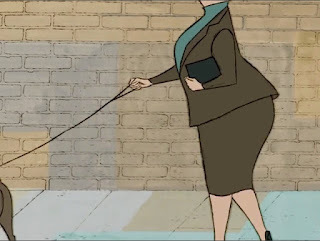 Even something as potentially trivial as how someone holds a leash has been thought out to be consistent with what the artists want to communicate. 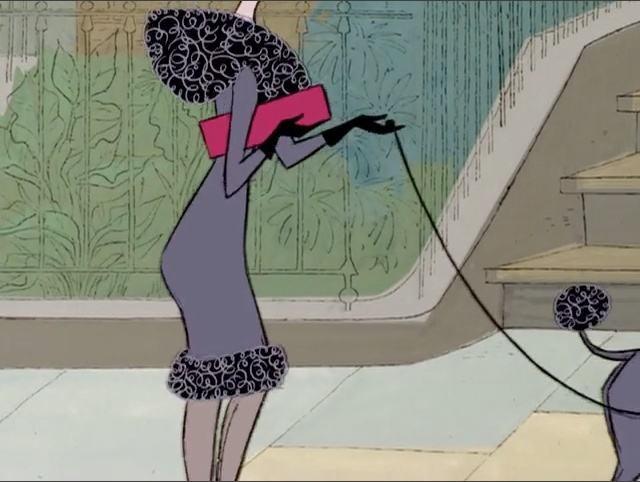 The credited animators for the walks are Frank Thomas and Blaine Gibson. It's impossible to know what came from the designs and what was added in animation, but these walks are a testament to how much information can be compressed into a short amount of time. That's the power of good design and expressive movement.